The French Legation is currently closed for restoration. GPS: N30° 16' 02.39" W97° 43' 54.35"
The French Legation began in 1841 as a private home for French chargé d’affaires to the Republic of Texas, Alphonse Dubois, after the French monarch officially recognized the Republic of Texas as a sovereign nation. Dubois was promoted to “chargé d’affaires” which is a diplomat who heads an embassy in the absence of the ambassador, and established an official legation in Texas. When Dubois was unable to find a suitable house, he hired builders to construct the historic Legation house. By December 1841, the capital moved from Austin back to Houston. Dr. Joseph W. Robertson bought the property in 1848, and he, his wife, and their 11 children and nine enslaved workers lived at the site. The Robertsons’ daughter, Lillie, lived in the home her entire life, and in her later years opened the house to the public, offering tours of what she called the “Old French Embassy.” Following her death, the state of Texas acquired the house, and the Daughters of the Republic of Texas (DRT) were appointed as the property’s custodian. The DRT opened the French Legation to the public in 1956. On June 12, 2017, Gov. 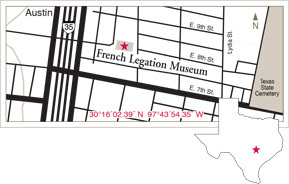 Greg Abbott signed into law House Bill 3810, to transfer the French Legation to the Texas Historical Commission (THC), effective September 1, 2017. Concurrent to the transfer of the property, the state agreed to allocate $1.56 million in emergency deferred maintenance funds to address the most pressing structural problems of the Legation building. Help us preserve Texas history. Donate now to support the preservation, education, and outreach activities of the French Legation. French Legation State Historic Site is located in the Texas Hill Country Trail Region.